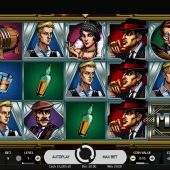 Moonshine Riches slot is a rare 9-liner from Netent, perhaps the most notable previous one being their high-volatility Reel Steal, itself a copy of the workings of Microgaming's Break Da Bank Again. Fear not, this slot isn't nearly as unforgiving though as we enter the world of 1930's U.S. alcohol prohibition and Speakeasy nights along with the dodgy characters they attracted. Certain criminal groups and the Mafia made fortunes from Prohibition, so can we share in the spoils too? We spin to the predictable soundtrack of bar room Jazz and the graphics on Moonshine Riches are quite decent, which regardless of game mechanic quality you do tend to find with most NetEnt games. The symbols are as one may expect too, with whiskey bottles, glasses and the characters you'd find in these underground drinking establishments are prevalent. An interesting difference here is that the higher-paying character icons are stacked while the lower ones appear singly which could be useful given there are only those 9 paying lines. The pays are quite good as we would presume given the fact there are so few lines in play, despite the fact symbols are stacked. 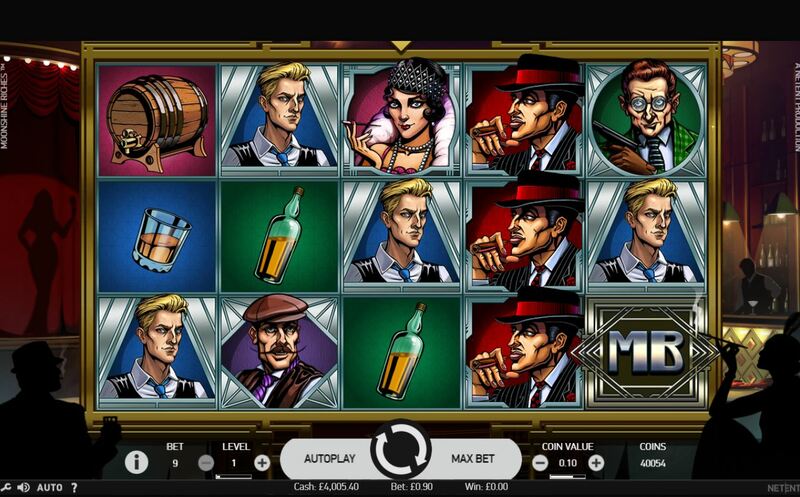 The gangster will award 350 coins for your 9-coin bet for a 5-of-a-kind (5OAK) hit, the Lady Entertainer 250 down to the lowest of the stacked characters, the Blonde Gigolo (who looks suspiciously like the cowboy from Netent's Wild Wild West game!) at 120 coins. There are no card values but the lower single icons are the Whiskey Barrel, Bottle and Tumbler paying 90, 70 and 45 coins respectively. There are two bonuses here, both of which are achieved by the presence of a Moonshine Bonus (MB) scatter on reels 1 and 5. These are also Wilds which means effectively you do get Wilds on all reels as the standard Wilds only appear singly on the centre 3 reels. It's not quite that simple though as it depends on which rows these land on. If they are on different rows, one of them will expand to the other side of the grid along its row, turning all the other 4 tiles into the same symbol for a 5-of-a-kind win - this cannot be a Wild but it's usually one of the higher-paying picture icons. This is called the 'Ricochet Reward'. If your MB scatters land on the same row then you will trigger 5 free spins in which any Wilds appearing will become sticky, also adding one extra free spin to the round. We will leave the best until last; an increasing multiplier starting at 1x is added for each spin, win or lose. Now before we get excited by this, the caveat is that you play the free spins on just one payline across the centre row but you do begin with the centre position Wild. Yes, I thought it sounded too good to be true! This means the most spins you can get are 9 with a final 8x multiplier. If you hit the Wilds sequentially you'd effectively play the last 5 spins with a fixed wild line and increasing multiplier so this 'Territory Takeover' bonus could certainly pay big. I must add that it appears this bonus can often pay little or nothing though, as Netent have thoughtfully added a 'Bootlegger Bounty Bonus' which kicks in if you get a zero-paying result from these free games. You smash some whiskey bottles to win between 10 and 75 x bet. This has shocking echoes of the dreaded WMS 'Feature Guarantee' on games like Raging Rhino and Montezuma.